Strikeforce Nick Diaz vs KJ Noons 2 Results | MMA Fighting Events Videos Techniques UFC Fight Picks and News. 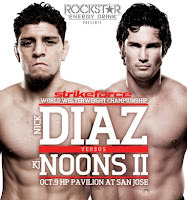 Nick Diaz faced KJ Noons in this Strikeforce event. The fight was a rematch that took three years to make. Diaz came into the fight looking to avenge the last loss in his career. To begin the fight, the two fighters came out slowly, feeling each other out. Diaz threw a right cross that dropped Noons to the mat. Diaz moved to side control, but Noons was able to get up. Both fighters threw chingasos, but Noons landed more. Noons landed combinations to begin the second round. Noons cut Diaz as they both continued the trash talking that preceded the fight. Noons landed more shots and repeatedly went to the body. Noons kept on jabbing, going to the body, throwing hooks, and throwing upper cuts. Noons dominated the round. Diaz shot in to begin round three, but Noons easily stuffed it. Both fighters stayed in the pocket and threw chingasos. Some of the strikes were quick ones, but others were thrown with intentions of ending the fight. Neither fighter landed many hard chingasos, but both fighters did land plenty of times. The fourth round continued where the third left off. However, Diaz did land enough to draw blood from Noons’s nose. Both men kept landing blow after blow as the round continued. This round Diaz started going to the body. In the fifth and final round, Diaz once again started with a takedown attempt. And, Noons once again stuffed it with the fight continuing standing. Both fighters continued by throwing chingasos, as they did the previous rounds. Diaz ended the fight with a gash right on his right eyebrow. Noons’s face ended up beat up as well. According to the stats, Noons threw and landed more chingasos. However, Diaz took the unanimous decision over Noons. Cavalcante landed a chingaso on Thompson’s right temple, to begin the fight. Thompson started going down, and Cavalcante went immediately for a guillotine. He held it tight, but he could not finish. Thompson ended up on top and threw his own chingasos. Thompson got a bit sloppy and Cavalcante went for submissions from the bottom. Thompson got to half guard, trapped an arm, and went for an arm triangle. The round ended. In the second round, the two men clinched up and ended up against the fence. They jockeyed for position before Thompson finally got Cavalcante to the ground. Thompson got Cavalcante’s back and threw chingasos while controlling Cavalcante. Cavalcante was able to get back to half guard. Thompson threw more chingasos as the round ended. Thompson went for a takedown to start the third round but just ended up in the clinch. Cavalcante ended up getting the takedown and went straight to the mount. Thompson got out and momentarily held Cavalcante with the rubber guard. The fight went to the feet again, but only for a moment. Cavalcante ended up on top and threw a chingaso that caught Thompson. The fight ended with Cavalcante on top inside the guard. Thompson got the unanimous decision. In round one, the two ladies met in the middle and immediately started throwing chingasos. They clinched up, got against the fence, and the referee broke them up as the action slowed down. Coenen landed a couple of hard blows. They clinched up again, and once again the referee stepped in. Coenen landed hard chingasos to end the round. In round two, Coenen used her height and reach advantage to control the striking. The ladies clinched and Kaufman used her strength to hold Coenen against the cage. Coenen threw a kick that landed on Kaufman’s body. Kaufman grabbed the leg and used the opportunity to press Coenen against the cage. The referee broke it up again. Coenen used her jab to stifle Kaufman. When they clinched, Coenen went for a hip toss, but Kaufman immediately reversed, as they hit the ground. Kaufman landed some chingasos, and Coenen went for the submission as the round ended. In the third round, Coenen threw Kaufman to the ground, but Kaufman reversed. Kaufman threw hard chingasos and landed many of the shots. Coenen trapped Kaufman’s right arm, rotated her hips, and went for the armbar. Kaufman tapped and the referee stepped in to end the fight. Coenen is now the new Strikeforce Women’s Welterweight Champion. To begin the fight, neither of the two men worried much about the feeling out process. They each threw a few chingasos to get the fight started. Galvao decided to shoot in, but he got stuffed and took some pounding. Galvao shot in again, got stuffed, and took more chingasos. Woodley let Galvao get up, but Galvao wobbled and had a hard time standing straight. Galvao approached Woodley and shot in for a single again. Woodley cocked back and threw a chingasos that got Galvao perfectly. The referee stepped in to stop the fight. Bouscal defeated Mendoza via an arm triangle choke in the second round. MacDonald defeated Keslar via unanimous decision. Terry defeated Marshall via unanimous decision.